Looking for the best sports bar in downtown Vancouver? You’ve found it. At first glance, one might mistake it for a regular pub. Wings, nachos, and calamari — the usual appy suspects — top the menu. With 15 micro-brews on tap, Dale Mackay’s new second concept is, in every respect, a sports bar. To expect the familiar would be ignorant, however, with Canada’s Top Chef at the reigns. Ensemble Tapwill no doubt attract throngs of non-sports fans when word of its entirely unprecedented bar food gets out (if it hasn’t already). While toiling over the menu, several staff members suggested the Chicken Burger — Mackay’s gourmet take on his favorite drive-thru item: the McChicken Sandwich. Immediately intrigued, I obliged. Like the mass-produced original, Tap’s includes shredded lettuce and breaded chicken. Similarities end here. Killer smoky paprika mayo, crushed avocado, and crispy bacon — a triple threat — lay between Terra Breads’ dense focaccia. 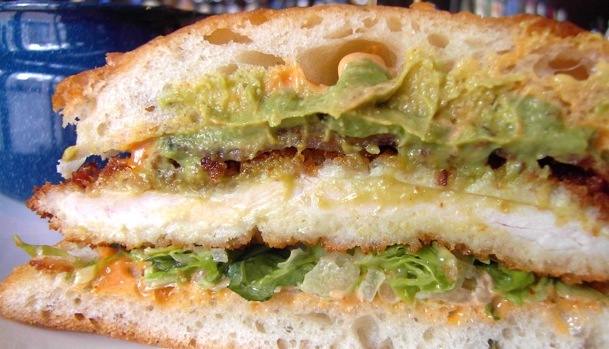 ‘I was lovin’ it’ so much, that this sandwich lands on my ‘best of 2011’ Lunch Rush list.